Status Message Site open, no currently reported issues. Bottom Landing Limited. See map for landing field marked ‘A’. Please note that this is very demanding for HGs, and may be unreachable for PGs. Please check the possibilities before launching. This is an excellent thermic site, but due to its demanding nature must be considered as suitable for very experienced pilots only. Curbar Edge is a good cross-country site, with good thermals coming from the Curbar valley. The ridge extends for some distance to the north, with west-facing Baslow Edge to the south. There are a number of possible landing fields, most of which are small and sloping, which could be used in an emergency. Hang glider pilots will need very good technique to land in the main field marked ‘L’. This field is the only official bottom landing! Top landing can be attempted immediately behind take off in light winds, but this requires good technique to avoid the nearby rotor. In stronger winds, landings are best made well back from the edge on the moorland, on the southern end of White Edge, some 600 to 800 metres behind the edge. This is a Peak District National Park Site of Special Scientific Interest (SSSI) so care should be taken in this location. Take-off is a rocky cliff launch and assistance, as well as care, may be required. There is danger of severe rotor behind take-off and the cliff sections. The site is frequently used by large model aircraft. Bottom landing is extremely hazardous with many hidden boulders and steep slopes. Top to bottom flights are not advisable here. Paragliders soaring the ridge to the north must be aware that they may not be able to glide clear of the trees. 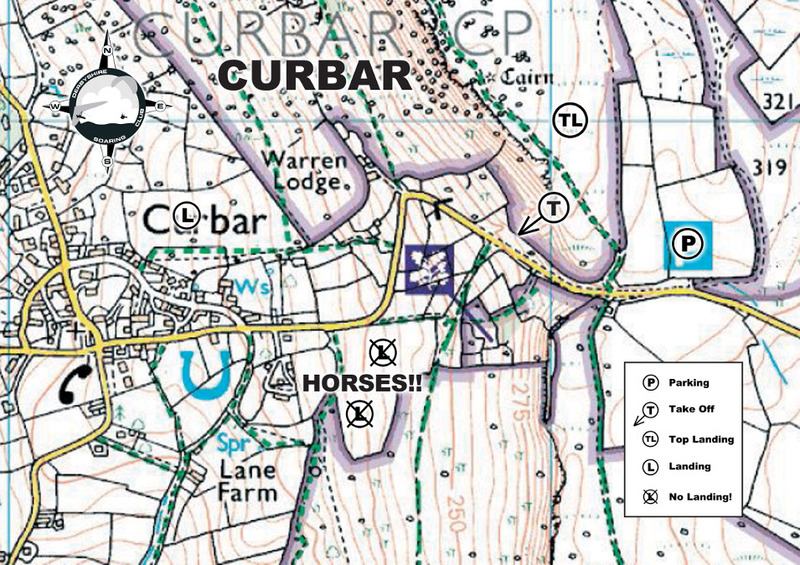 You must NOT land in the fields marked with a crossed ‘L’ as they are owned and used by the riding stables. The owner will challenge you robustly if you land there. If this happens, BE POLITE, as it is your fault. Park in the pay and display car park on the north side of the road immediately behind the edge. Approach via a minor road through Curbar village which passes over the edge, and links the A623 and A621. A footpath crosses the road west of the car park, follow this path north before turning towards the edge. The take-off point is where the edge is more rounded to the south of the cliff.